OUSD officials said Amethods Oakland Charter Academy doesn't have a plan to assist special needs students. Even members of the Oakland Unified School District board appeared surprised last night when they denied a charter school permission to continue operating. The Oakland Charter Academy middle school was asking for a renewal of its charter petition, but several school board members said Amethods, the school's parent organization, which runs two other charter schools in Oakland, hasn't been serving the city's diverse population equally. They also said Amethods hasn't been transparent about its budget and governance. Supporters of the school contend, however, that it outperforms OUSD's public schools and that it does serve a diverse population. "About the outperformance of OUSD schools, if you’re not serving as many high needs students, then of course it’s going to look like you’re outperforming schools that are serving high needs students," said OUSD director Shanthi Gonzales. According to OUSD records, the student population at Oakland Charter Academy is 85 percent Hispanic or Latino, and 95 percent of its students qualify for free or reduced price meals, a sign that they come from lower-income families. About 37 percent of the school's students are English language learners, higher than the district's 31 percent average. But Amethods Public Schools CEO Jorge Lopez said Oakland Charter Academy's demographics reflect nearby OUSD public schools. "If you look at Urban Promise Academy," he said, referring to an OUSD school, "their Latino population is 83 percent. Their Black student population is 6 percent." According to an OUSD report considered by the district board last night, Oakland Charter Academy's special education students only make up 7 percent of the school's enrollment while OUSD's average is 12 percent. And Black students, who make up a quarter of OUSD's total enrollment, only represent 5 percent of the charter school's student body. Lopez said these numbers are over a year old and that the school has increased its percentage of special education students in the current year. OUSD staff wrote in a report that Amethods administrators "did not indicate how the school was specifically planning on providing additional support to English Learners, African Americans, or the Students with Disabilities," and that "the school should create an action plan targeting these groups of students in order to eliminate the identified achievement gaps." A compliance overview by OUSD of the Amethods school noted several complaints between 2015 and the present alleging that the school's teachers are mostly uncredentialed, and that special education students are being taught by teachers without the necessary training. 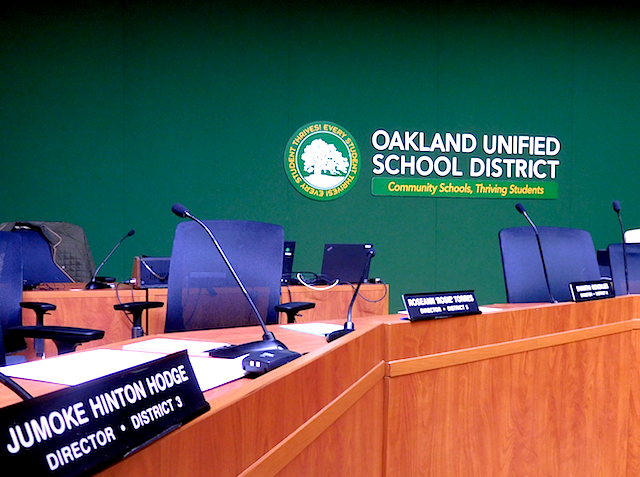 "Out of 15 teachers on staff, only two have credentials," said OUSD director Jody London before last night's vote. "The rest are operating on temporary, interim basis." According to the compliance report, a former Amethods administrator alleged this year that "special education students are pushed out of the Amethods schools/are not taught by credentialed teachers." Lopez attributed this to the difficulty of recruiting teachers to Oakland, where the cost of living, especially rent, has outpaced pay. He said his school has undertaken efforts to provide a career path for long-term employment. Other complaints alleged an "overall culture of fear due to intimidation and harsh behavior by the principal/leadership towards students, teachers, and parents," and also "demeaning language by principal towards students." An OUSD audit also found that Amethods administrators failed to make basic governing documents public, including budget reports, a conflict of interest policy, and contact information for Amethods board members. Even though they flagged these problems, OUSD staff recommended that the board renew the charter school's petition to operate. Oakland — where about 30 percent of students are enrolled in charters, one of the highest rates in the nation — continues to be at the center of a divisive education debate. Charter supports say the schools provide choice and often out-perform traditional public schools because they have more flexibility in staffing and curriculum. Critics say charters "privatize" education, lead to a lack of transparency, and exclude students with the greatest needs. OUSD directors James Harris, Jumoke Hinton-Hodge, and Aimee Eng voted in favor of renewing the Amethods charter petition last night. Directors Gonzales and London voted no. Because director Nina Senn abstained, and director Rosie Torres was absent, the petition renewal didn't receive enough votes to pass. Lopez said the vote puts Amethods Oakland Charter Academy in "limbo" because the school board didn't vote down the charter petition renewal. Rather, they failed to approve it. That means the school may not be able to go to the county office of education and seek approval to continue operating. He said the school is currently considering its options.